This article discusses various cleaning products and methods later. It also explains what causes the problem, and how to avoid it. I’ve tested many washing machine cleaning products. They do a good job of freshening up a relatively clean washer or dishwasher. But I’ve not found them as effective at curing a seriously smelly washing machine if it is caked in grease and slime. Plumbing faults can also be responsible for washing machine or dishwasher smells. Does the smell seem to come from around the washing machine rather than from inside the drum? If so, a bad smell could be coming from the plumbing. 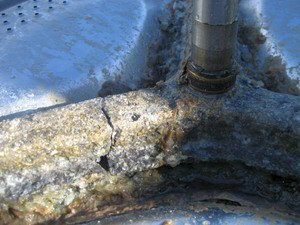 Check out this article for more details – smells caused by plumbing faults. What causes washing machine smells? There is strong suspicion that this problem started after detergent manufacturers removed certain elements from their detergent that were deemed harmful to the environment. I remember a lot of talk about phosphates in the early 80s. Prior to this I wasn’t aware of this issue at all. Another contributing factor, or at least one that makes the problem worse, is low temperature washes and liquid detergent. Most people don’t use hot washes any more. Hot water (above 60 degrees Fahrenheit) helps to kill bacteria and cut down grease. If you mostly use low temperature washes, especially in combination with liquid detergent, then this is likely to ruin your washing machine. Likewise if you mostly use washing machine detergent that doesn’t contain any bleaching agents such as colour friendly detergent. This gunge also rots hoses & door seals. It blocks the pressure system causing overfilling or spin failure. It even eats away at the aluminium based drum spiders causing one or more of the drum’s arms to disintegrate. It’s usually fatal to the washing machine. Almost everyone suffering the worst cases of this slimy grease uses 40 degree or 30 degree washes almost exclusively. If combined with poor quality detergents, not using the recommended quantities (very important), or only using colour-friendly or liquid detergent it allows bacteria, grease and limescale to thrive. Over time this can seriously rot a washing machine inside and shorten its lifespan. Grease and slime has built up on the underside of this door seal. It smells. This level of slime will have infested the whole washing machine inside. The owner only used liquid detergents, and low temperature washes. This door seal has been removed, but whist still fitted most of this slime is not visible. Examine the underside of your door seal for slime and grease. Open the door and pull it back where it fits up to the lip of the inner drum. Have a good look underneath. Is the door seal and lip of the main drum covered in grease and limescale? If so you have a problem that needs dealing with. As with many problems, avoidance is by far the best policy. The best way to avoid a smelly washing machine is to use good quality, powder detergent. Also regularly use the hot washes. It’s important to use the proper quantity of detergent. Not using enough detergent may produce acceptable wash results but at a heavy price for the washing machine inside. 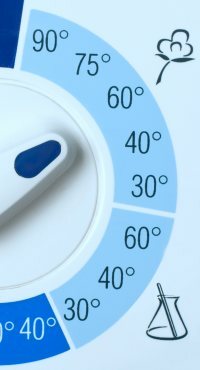 Try to wash bedding and towels at 60 degrees (if their wash labels allow it). In theory if you do this you shouldn’t have a problem with smells, grease, bacteria or limescale. If you insist on using low temperature washes and liquid detergent you should do a hot maintenance wash once a week. Washing at 30 degrees The best detergent to use is detergent containing bleaching agents. For more details see Which is the best type of washing machine detergent? The last product on the list is by far the best cleaning product I’ve tested so far and suitable for all washing machines and dishwashers. I’ve tested this several times on my own washing machine and it definitely removed a lot of limescale. White distilled vinegar has an array of uses. I’ve seen many reports from people saying that distilled white vinegar does actually work. I haven’t tried it myself though. Try putting half a cup of white (distilled) vinegar inside an empty washing machine on a boil wash cycle. The best way to do this is to wait until the washing machine has been filling for several seconds before pouring the vinegar into the soap drawer. Don’t place it inside the drum. If you do the vinegar may run straight into the sump hose and be wasted. Soda crystals dissolve grease. So you might also want to try to clean the washing machine inside with them. Pour half a packet inside the soap drawer whilst it’s filling with water. Using this method every month or so can help prevent smells from your washing machine. 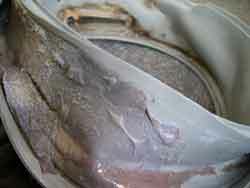 Remember it will be difficult to remove grease and slime if your washing machine is badly affected. Use it on a boil wash with no laundry inside. I had this “black mould” clinging to the sides of washer after a load was washed. I called the appliance guy and he gave me several remedies which were basically the same as yours. One thing I did find on-line was the advice to leave the washing machine door (I have a top loader) open until the washer is completely dry. It seems like this would be advice the makers would put in your operators manual, doesn’t it? My husband found out that the top of the washer will raise up…and took the top of the inside tub off — it is completely covered in the black mold – disgusting!!! No wonder it showed up now and then in my washer. Thanks Leigh. Always leave the door open after using to help dry out the drum and door seal. However with many washing machines there is so much water left in the bottom of the door seal that it would take several weeks to dry out. In such cases it’s best to wipe it out manually. White distilled vinegar has an array of uses. I’ve had reports back from people saying that distilled white vinegar does actually work. Try putting half a cup of white (distilled) vinegar inside an empty washing machine on a boil wash cycle. Wait until the washing machine has been filling for several seconds before pouring the vinegar into the soap drawer. The vinegar may run straight into the sump hose and be wasted otherwise. Please clarify the above article? First you say to put the vinegar inside the washing machine, then you say put it in the soap draw! Thank you for your advise, all very interesting. I have used commercial, soda crystals (though not the 1/2 packet as you suggest) and white vinegar in my machine over the years and can say that all seem to work inside the machine, but have not found a way of keeping the filler draw area free of mold. I do take out the draw and clean it with bleach, but cannot clean inside this space. I also always leave the door ajar. My Zanussi’s (I on the my second one) have always given me excellent service, much better than Hotpoint, Service. I also use a ‘liquid detergent’ now, but think that I will go back to a powder for tablet. Is ‘powder’ any better than ‘tablet’? I have come to your articles as I now need to replace my machine as it is not work through some of the programmes correctly, and like to use a ‘hot and cold’ fill, as the ‘hotter’ (50) gives me a quicker wash, and have a combi boiler, with short pipework, but it looks like I will just have to go with a cold fill after all.. I has been very good to have someone taking the time to explain about the different machines and also how the ‘washing products’ work, also your tips in keeping the machines ‘sweet’ Thank you very much. Hello Tessa. Thanks for your comment. My article said to put the vinegar inside the washing machine and then went on to describe how to do it. However, I have just reworded that section, which will hopefully make it more clear than it was. Thank you for your feedback. I have an article about detergents here – Which is the best type of washing machine detergent? Thanks for the article. We have been having this issue on Samsung washer less than 2 yrs old. I did use the vinegar, however still found a lot the black stuff in the clothes. Found that a flexible brush (Brushtech Hair Catching and Sink Overflow Cleaning Brush from B.B & Beyond) helped a great deal in getting in behind upper part of the tub and the basin that it sits in. This was able to reach about half way down the tubs backside. It came out black at first. The water level never gets to the upper part of the tub, and the self cleaning doesn’t seem to either. So this area gets damp, but never soaked in water or cleaning solution. Have ordered a Brushtech Extra Long Super Flexible Drain Brush, 48-Inch from Amazon, to reach to the bottom of the tub. It seems like the manufacturers could come up with a better way to clean this.